Logan, UT – April 1, 2014 — Juniper Systems has announced the availability of its much anticipated new rugged handheld, the Archer Nano DOS™. 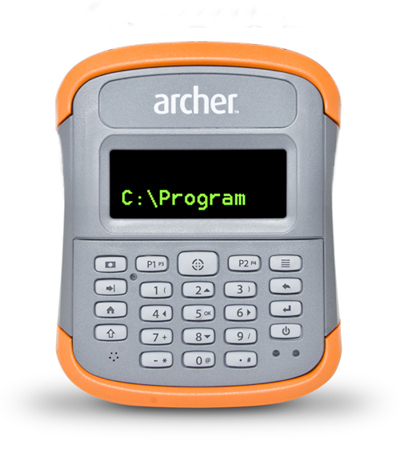 With radical improvements over the first generation Archer™, the Archer Nano DOS promises better overall performance with an astonishingly bright two-line green display, a solar-powered battery panel, enhanced GPS capabilities, and rugged IP68 construction. The latest generation handheld incorporates several new technological advancements. Sporting a custom 2 line x 16 character super-bright green display, the Archer Nano DOS screen has been well received by reviewers. The Archer Nano DOS features the latest Juniper Systems Disc Operating System (“DOS”), based on the recently released public source code for MS-DOS, and capable of performing thousands of complex calculations. This new iteration of a lightweight operating system uses only 12K bytes of memory, freeing up the remaining 300 KB of storage for enhanced data collection and file management. By relying on a proven lightweight operating system, the Archer Nano DOS frees up the awesome horsepower of the Archer 2 series architecture, and only requires the use of 16 stacked CR2032 3V batteries to run an entire day. With a Serial port interface, and additional ports to connect to both Parallel and SCSI interface external disc drives, the Archer Nano DOS promises virtually unlimited data access options. Future versions promise connectivity to external modems and the “World Wide Web”. Enhanced versions will support RFID readers and barcode scanning capability, infrared printer support, and meter-accurate GPS and cellular modem connectivity. Like other Juniper Systems handhelds, the Archer Nano DOS is built to very strict standards at its ISO 9001:2008-certified facility, having been tested to MIL-STD-810G and given a top IP68 rating for dust and water. Those interested in learning more about the Archer Nano DOS may visit Juniper Systems’ website at www.junipersys.com/archerNanoDOS. With locations in Utah, USA and Birmingham, UK, Juniper Systems designs and manufactures rugged handheld computers and provides field data collection solutions for use in extreme environments. Since 1993, Juniper Systems has provided innovative mobile technology to natural resources, public works, geomatics, agriculture, industrial, and military markets. For more information on Juniper Systems products, please visit www.junipersys.com.